I don’t miss doing night calls. At this point of my life, working through the night would probably kill me. But night calls are part and parcel of a doctor’s life and they were probably what trained many of us in clinical judgment and decision-making as we had no choice but to make and stand by our decisions in the middle of the night. There was a certain camaraderie about being on call (despite the exhaustion) and many of the nurses I worked side by side with in those formative years remain good friends today. The one perk about being on call was that we would often share a meal at midnight. This was the essential meal that we needed for the next 8 hours before relief came when the morning team would come on. As we had to work 30 hours straight, the wee hours of the night were particularly hard to get through. So at midnight, we would usually take a break together with the intensive care nurses and share a light meal. This was the witching hour when we ate, chatted and learned about each others’ lives and occasionally the sessions would get hysterical as one of my colleagues would actually get up to sing (and dance to) karaoke type songs. Then we would go back to managing new admissions and tracking lab results, but energized by that brief period of jollity. That midnight meal was usually very simple however – at that time the hospital cafeteria was usually closed. Or whatever was open had pretty unpalatable leftover food. Occasionally we would send a house officer (one with a car) to drive out to buy supper, or sometimes one of the nurses would cook something in a rice-cooker for everyone. I remember during my rotation to the neonatal ICU as a medical officer that the ward sister herself would prepare an amazingly ingredient-dense rice congee. It was so full of protein (both century egg and salted egg as well as chicken or pork) that I swear a bowl of her congee would put hair on the chest. So it is with this food memory that I reconstructed Sister’s midnight rice congee. The low carb adaptation was to use cauliflower that has been processed to small rice-like pellets. I confess I was terribly pleased with this recipe. In missing some of the high carb staples of my past, I had previously dreamed up a list of dishes that I imagined I would eat the week before I died (on the assumption that it wouldn’t matter by then whether I ate low carb or not, and granted I could still actually put food down my throat!). Century egg porridge (Pei Dan Jook), Char Kuay Teow and Hokkien Mee, Bak Chor Mee and curry puffs all occupy prominent places in my dream food list. It finally occurred to me recently that I could make a replica of rice porridge from using cauliflower as a low carb substitute for rice. I had been making cauliflower fried “rice” for quite a while already; it still surprises me how long it took me to figure out that I could make rice porridge or congee out of cauliflower 🙄. The cauliflower rice cooked this way was amazingly good. The slightly pungent flavor of raw cauliflower completely disappears when simmered for a duration and adds a sweetness to the broth rather than a vegetable-y flavor. 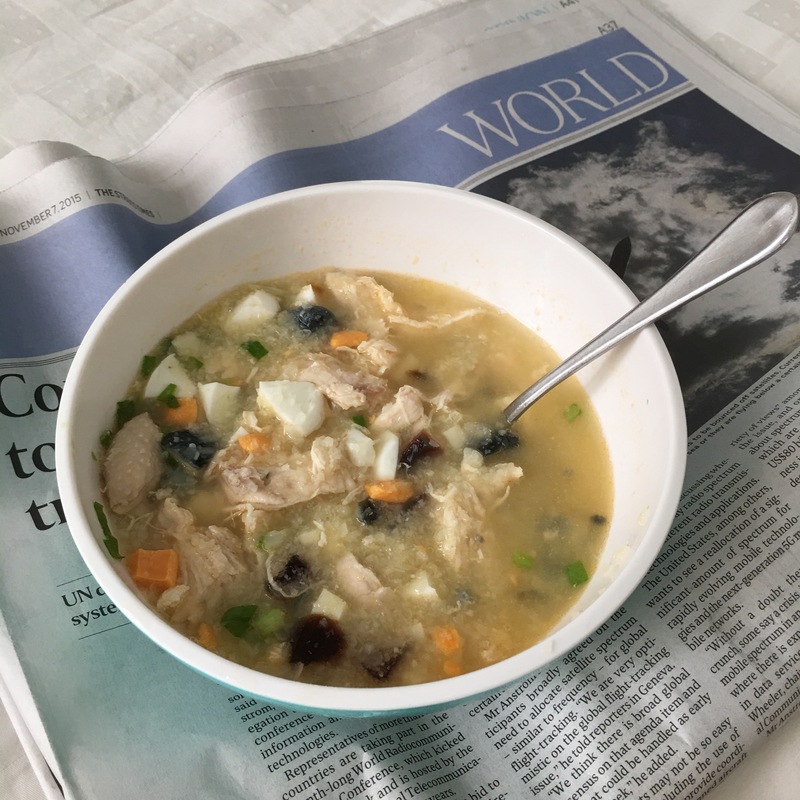 Pei Dan Jook or Century Egg Rice Porridge is a common breakfast food in East Asia. The origins are probably Cantonese and the perfect Jook should be silky smooth and absolutely warm and comforting to the tender Chinese belly. The best Jook is usually made from a combination of jasmine rice and starchier glutinous rice grains, and some recipes even use a thickener like glutinous rice flour. In this recipe, the congee is not thick and gummy like the typical Cantonese-style porridge but is slightly more reminiscent of the Teochew style that has a more distinct soup and rice texture. This hearty version of chicken congee is chock-full of protein thanks to the chicken and eggs and so is pretty filling. What is amazing is that it rates only about 8g carbs per serving, about a quarter that of the real rice version. So I’ve managed to tick off one more item off my food bucket list. Who knows, one day I may find a way to convert all my food cravings into healthy low carb options! There’s nothing better than a bowl of hot congee and the weekend paper. Put chicken breast into the 2 cups of water in a pot. Bring to boil over high heat. In the meantime, put the cauliflower florets into a food processor and pulse till fine rice grain size. Put the cauliflower grains into the chicken soup and continue to simmer for about 20 minutes. Remove the chicken breast from the pot and shred the chicken, then return the chicken shreds back to the pot. Add salt, pepper and the chopped century egg and salted duck egg into the pot. Stir through and simmer another 3-4 minutes. Serve hot with a sprinkling of spring onions on the top. Wow you’re a doctor! SIgh you’re probably the only one believing in LCHF. But then some will argue that it’s not “real food”, so yeah cauliflower is definitely more natural less processed. Nice link to Heston’s recipe, thanks! The reason why I took so long to figure cauliflower “rice” porridge is that I make so much cauliflower purée and soup that I forgot I could make the rice grains from pre-chopping the cauliflower really small. Ultimately though I am just so grateful to have some sort of porridge again. I will try to see if I can get something a bit closer to the Cantonese version soon!